San Luis Obispo County, officially the County of San Luis Obispo, is a county located in the southern region of the U.S. state of California. As of the 2010 census, the population was 269,637. The county seat is San Luis Obispo. The entrance lobby and belfry of the Mission San Luis Obispo de Tolosa. A statue of Fray Junípero Serra stands outside the church. San Luis Obispo County (locally, SLO County) comprises the San Luis Obispo-Paso Robles-Arroyo Grande, CA Metropolitan Statistical Area. 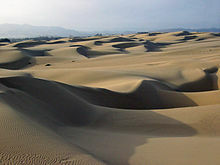 The county is located along the Pacific Ocean in Central California, between Los Angeles and the San Francisco Bay Area. 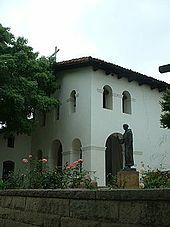 Father Junipero Serra founded the Mission San Luis Obispo de Tolosa in 1772 and the Mission is today an active part of downtown San Luis Obispo (popularly referred to as SLO or SLO-town). The small size of the county's communities, scattered along the beaches, coastal hills, and mountains of the Santa Lucia range, provides a wide variety of coastal and inland hill ecologies to support many kinds of fishing, agriculture, and tourist activities. The mainstays of the economy are California Polytechnic State University with its almost 20,000 students, tourism, and agriculture. San Luis Obispo County is the third largest producer of wine in California, surpassed only by Sonoma and Napa Counties. Wine grapes are the second largest agricultural crop in the county (after strawberries), and the wine production they support creates a direct economic impact and a growing wine country vacation industry. The town of San Simeon is located at the foot of the ridge where newspaper publisher William Randolph Hearst built Hearst Castle. Other coastal towns (listed from North to South) include Cambria, Cayucos, Morro Bay, and Los Osos -Baywood Park. These cities and villages are located northwest of San Luis Obispo city, and Avila Beach and the Five Cities Region to the south which were originally: Arroyo Grande, Grover Beach (then known as Grover City), Oceano, Fair Oaks and Halcyon. Today, the Five Cities Region consists of Pismo Beach, Grover Beach and Oceano (County), basically the area from Pismo Beach to Oceano. Nipomo, just south of the Five Cities, borders northern Santa Barbara County. Inland, the cities of Paso Robles, Templeton, and Atascadero lie along the Salinas River, near the Paso Robles wine region. San Luis Obispo lies south of Atascadero and north of the Five Cities region. Mission San Luis Obispo de Tolosa was founded on September 1, 1772 in the area that is now the city of San Luis Obispo. The namesake of the mission, city and county is Saint Louis of Toulouse, the young bishop of Toulouse (Obispo and Tolosa in Spanish) in 1297. San Luis Obispo County was one of the original counties of California, created in 1850 at the time of statehood. The Salinas River Valley, a region that figures strongly in several Steinbeck novels, stretches north from San Luis Obispo County. The remote California Valley near Soda Lake is the region most untouched by modernity. Travels through this area and the hills east of highway 101 during wildflower season are very beautiful and can be incorporated with wine tasting at local vineyards. Piedras Blancas State Marine Reserve and Marine Conservation Area, an elephant seal rookery. As of the census of 2000, there were 246,681 residents, 92,739 households, and 58,611 families in the county. The population density was 75 people per square mile (29/km²). There were 102,275 housing units at an average density of 31 per square mile (12/km²). The racial makeup of the county was 84.6% White, 2.0% Black or African American, 1.0% Native American, 2.7% Asian, 0.1% Pacific Islander, 6.2% from other races, and 3.4% from two or more races. 16.3% of the population were Hispanic or Latino of any race. 13.9% were of German, 11.4% English, 9.7% Irish, 6.1% American and 5.7% Italian ancestry according to Census 2000. 85.7% spoke English and 10.7% Spanish as their first language. There were 92,739 households out of which 28.2% had children under the age of 18 living with them, 50.40% were married couples living together, 9.1% had a female householder with no husband present, and 36.8% were non-families. 26.0% of all households were made up of individuals and 10.3% had someone living alone who was 65 years of age or older. The average household size was 2.49 and the average family size was 3.01. In the county, the population was spread out with 21.7% under the age of 18, 13.6% from 18 to 24, 27.0% from 25 to 44, 23.3% from 45 to 64, and 14.5% who were 65 years of age or older. The median age was 37 years. For every 100 females there were 105.6 males. For every 100 females age 18 and over, there were 105.2 males. The median income for a household in the county was $42,428, and the median income for a family was $52,447. Males had a median income of $40,726 versus $27,450 for females. The per capita income for the county was $21,864. About 6.8% of families and 12.8% of the population were below the poverty line, including 11.4% of those under age 18 and 5.9% of those age 65 or over. San Luis Obispo County leaned toward the Republican Party in presidential and congressional elections during the 20th century; it has, however, become more Democratic during the 2000s and 2010s. In 2008, Barack Obama won the county with 51.2 percent of the vote. Prior to 2008, the last Democrat to win a majority in the county was Lyndon Johnson in 1964, although Bill Clinton won a plurality in 1992. In 2012, Obama again won the county, this time with a slim plurality of the vote. The county backed Democrat Jerry Brown during his 2014 re-election campaign after having supported his Republican opponent, Meg Whitman, in 2010. Prior to this, the last Democrat to carry the county in a gubernatorial election was Gray Davis in 1998. With respect to the United States House of Representatives, San Luis Obispo County is in California's 24th congressional district, represented by Democrat Salud Carbajal. From 2003 until 2013, the county was split between the Bakersfield-based 22nd district, which was represented by Republican Kevin McCarthy and included Paso Robles and most of the more conservative inland areas of the county, and Lois Capps' 23rd district, a strip which included most of the county's more liberal coastal areas as well as coastal areas of Santa Barbara and Ventura Counties. With respect to the California State Senate, the county is in the 17th Senate District, represented by Democrat Bill Monning. With respect to the California State Assembly, the county is in the 35th Assembly District, represented by Republican Jordan Cunningham. In April 2008, the California Secretary of State reported that there were 147,326 registered voters in San Luis Obispo County. Of those voters, 61,226 (41.6%) were registered Republicans, 52,586 (35.7%) were registered Democratic, 8,030 (5.4%) are registered with other political parties, and 25,484 (17.3%) declined to state a political preference. The cities of Grover Beach, Morro Bay, and San Luis Obispo had pluralities or majorities of registered Democratic voters, whereas the rest of the county's towns, cities, and the unincorporated areas have a plurality or majority of registered Republican voters. San Luis Obispo County’s economy is primarily a service economy. Service jobs account for 38% of the County’s jobs, government jobs accounts for 20.7%, and manufacturing jobs represent 6% of the County's jobs. San Luis Obispo County is served by Amtrak trains and Greyhound Lines buses. The San Luis Obispo Regional Transit Authority provides countywide service along US 101 as well as service to Morro Bay, Los Osos, Cambria and San Simeon. The cities of San Luis Obispo, Atascadero and Paso Robles operate their own local bus services; all of these connect with SLORTA routes. Intercity service is provided by Amtrak trains, Greyhound and Orange Belt Stages buses. San Luis Obispo County Regional Airport (SBP) is located just south of the City of San Luis Obispo. Commercial flights are available. Paso Robles Municipal Airport (PRB) is located north-east of the City of Paso Robles and is home to California Highway Patrol, CAL-FIRE and the Estrella Warbirds Museum. Oceano County Airport (L52) is located on the coast in the 5 Cities area. The "Five Cities" as they are known today are: Arroyo Grande, Grover Beach, Oceano and Pismo Beach. Some people think that Shell Beach is separate from Pismo Beach, and while it was originally developed in the County, it was annexed into the City of Pismo Beach and is part of that City. Arroyo Grande, Grover Beach, Pismo Beach are the only incorporated cities. Oceano is a census-designated place, and Shell Beach is part of Pismo Beach. The population ranking of the following table is based on the 2010 census of San Luis Obispo County. ^ a b "Statewide Database". UC Regents. Retrieved November 18, 2014. ^ "Caliente Mountain". Peakbagger.com. Retrieved March 18, 2015. ^ Settevendemie, Marty. "2012 Crop Report" (PDF). San Luis Obispo County Department of Agriculture. 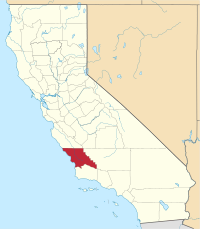 Wikimedia Commons has media related to San Luis Obispo County, California. Wikivoyage has a travel guide for San Luis Obispo County.